There was a small problem with the hard drive. The bay in which it sits does not have adequate ventilation. If you left the drive running for a long while, it would really heat up. Eventually, it could heat up to the point of softening the plastic around it. If you weren't using the monitor stand, and had just set the monitor on the main unit, that side could start to smush down. Another, less serious, problem with the drive was that it was LOUD. Not so much when it was just spinning, but you could really hear each and every disk access. It wasn't a bad sound, like a grinding. It was just alot louder than most drives. Top view with cover removed. The 90 degree slot adapter has been pulled out and is laying in the center of the slot bay. 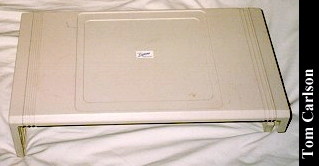 Top view with cover removed. Top side of monitor stand. Underside of monitor stand. Notice the extensive reinforcement ribs. Front view of complete Explorer package. Explorer with the keyboard folded up. 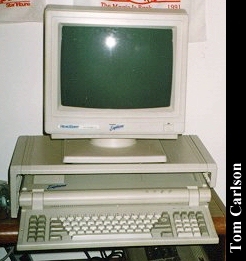 Rear view, showing the typical XT class ports. 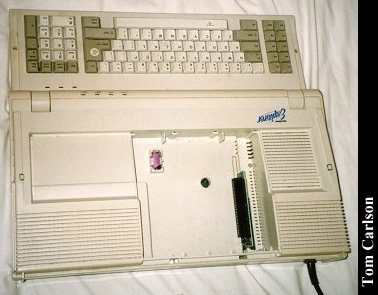 Front view of main unit with keyboard folded down. 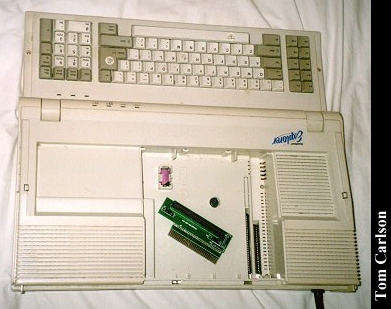 Front view of main unit with keyboard folded up. 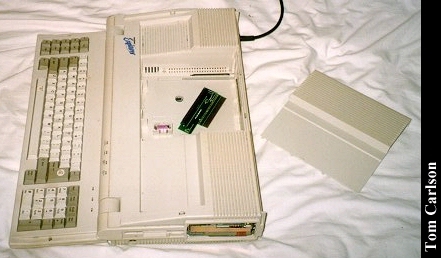 Side view showing the hard drive. Usually, there's a cover over this bay. There usually is more mounting hardware here, but it had been removed because it interfered with what little ventilation there was. 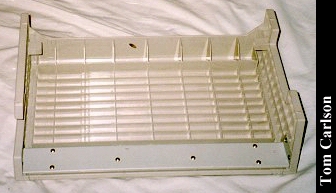 Shot of main unit, with the card bay cover to the side. Click here to view all comments for the HeadStart Explorer and to leave your own. 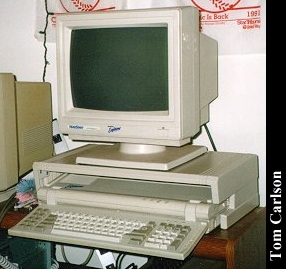 Click here to view comments about other HeadStart computers.